Make your plans now to attend the Ninth Annual USFG-Franklin Faceters Frolic on July 28, 29 and 30, 2016. We are part of the United States Faceters Guild and have expanded to a 3 day format to include more speakers and programs along with a broad array of dealers. The Franklin Faceters Frolic is held at the same time as the Macon County Gemboree and several other gem and mineral shows in Franklin, NC. The Frolic will be at the The Factory, (formerly known as The Fun Factory: same location as FFF8) in Franklin, NC. This year, Robert Strickland will offer three GemCad classes: Beginner, Intermediate and Advanced. The Beginner class will introduce you to the basic commands and features of GemCad. The Intermediate course will be a refresher on the basics and creating and modifying existing designs and creating new designs of your own. The Advanced course is for GemCad users who would like to explore the finer points of GemCad. 9:00 am to 11:00 am – GemCad for Beginners – For those who want to learn the basic How-To of GemCad Software. You should bring your Notebook with GemCad already loaded on it ready to go by 9:00 AM. You can down load a free trial of GemCad at www.gemcad.com 30 days before the class. If you do not purchase before you get there, you may purchase during the Frolic from Robert. Once you learn how to use GemCad, we believe you will realize the real value in this software tool for any level if faceting you do. 1:00 pm to 3:00 pm – Intermediate GemCad – For those who need a refresher on basic GemCad and further operations. 9:00 am – 11:00 am – Advanced GemCad – Robert will go into advanced capabilities of GemCad for the experienced user. 1:00 pm – 3:00 pm – Lisa Elser – “Going Pro” –Internationally known gem cutter Lisa Elser of Custom Cut Gems will speak about how she got started in business and her experiences as a faceter. 3:00 pm- 5:00 pm – Sue Lichtenberger – Kitchen Counter Rock and Gem ID. 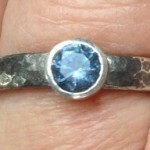 Sue will explain how to use readily available items to help identify gems and minerals. This is a hands on discussion and was a popular topic last year. 6:00 in The Depot Room – The Faceters Meet and Pretty Stone Contest. Come and enjoy meeting with the dealers, speakers and other faceters from around the world. Pizza and soft drinks will be available for $5.00 per person. Bring a stone that you have cut and enter in either the Natural or Simulated Gem division. Prizes will be awarded to the winner in each category. This is a “Beauty Contest” and the winners will be chosen by those in attendance. Dealers open for business in the Depot Room from 10:00 am to 4:00 pm. 10:00 am to 12:00 pm – Master Gem Cutter Jerry Call will discuss some of his cutting tips and techniques for Maximizing Your Rough. Last year, Jerry’s talk turned into a lively question and answer session covering a host of different topics. Don’t miss this opportunity to learn from one of the best! Tom Maxwell – Carolina Custom Gems – www.carolinacustomgems.com -Tom will have the Graves Mark 5XL digital faceting machine set up and available for demonstration and immediate delivery. Tom is also a representative for Ultra-Tec and will be demonstrating the latest Ultra-Tec V-5 digital faceting machine. In addition, Tom will have a complete line of Gearloose Polishing Laps and Polishing Products and fine facet rough. Ultra-Tec rep, Gerald Boykin will be demonstrating the Ultra-Tec Fantasy Machine. John Garsow – John E. Garsow Gems and Minerals – John will have a large selection of fine facet rough from all over the world. Dan Lynch – Dan will have sunstone, ametrine, zircon, tanzanite, heliodor, amethyst, and tourmaline, plus what he finds on a buying trip to Africa in June. Lisa Elser – Custom Cut Gems – www.lisaelser.com – Lisa will have a wide assortment of rough to choose from. You will find almost everything you would want in the way of faceting equipment and supplies along with facet rough not available anywhere else all in one place. These dealers are great people and have the highest ethical standards. Without their support, the Frolic couldn’t take place. Admission to the USFG-FFF9 is FREE again this year thanks to a generous support from the dealers and attendees. There will be DOOR PRIZES each day donated by the dealers along with a Grand Prize on Saturday donated by The Frolic. Raffle tickets will be $1.00 each and the more tickets you buy, the better your chances of winning some nice rough or faceting accessory. You do not have to be present to win, however contact information will be needed. The proceeds of the sale of raffle tickets goes a long way in supporting The Frolic and helping it grow. The Frolic is the only event of its kind for the faceting community in the Eastern United States.